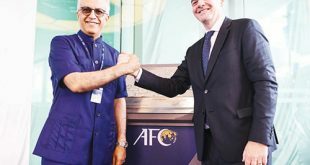 KUWAIT CITY, Sept 7: The Kuwaiti football crisis took a new dramatic turn that may have positive indicators, as the local clubs have overthrown the former board of directors headed by Sheikh Talal Al-Fahd and formed an interim committee to manage the affairs of Kuwaiti Football Federation for a renewable period of three months. Former President of Al-Arabi Sport Club Ibrahim Al-Shehab, who is popular among sports fans, heads the interim committee. All sports parties accepted him and he has a distinguished curriculum vitae in sports administrative activities. 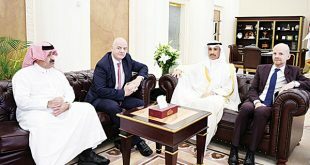 The committee consists of four members — Ibrahim Al-Neghmeesh, Thamir Al-Saleh, Rasheed Al-Rasheed and Omar Al-Shouhani, in addition to renewal of trust on Dr Mohammed Khaleel as Secretary General of the federation. In yesterday’s general assembly attended by 13 clubs, all clubs, except Al-Qadsiya Club which was absent, started to address the international federation FIFA to notify them on the decision to dissolve the board of directors based on amendments made in last Tuesday’s meeting. 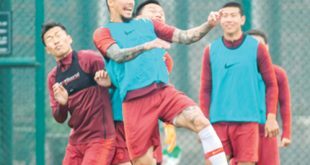 These amendments allow clubs to take steps to fill the administrative vacuum in the federation to manage football affairs, in addition to the fact that the former committee’s tenure was terminated as on Aug 25. The local clubs hope that these steps will put an end to the sports ban crisis. These steps were taken according to the articles of the basic law of the Kuwaiti federation as agreed upon by FIFA. 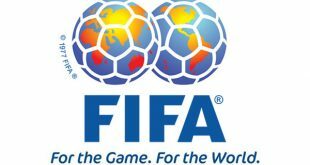 It is worth mentioning that FIFA recognizes the right of general assemblies to selfdetermination as long as there is no government intervention. Acting President of Al-Arabi club Abdul Razik Marafie confirmed the action taken by the general assembly of local clubs. These procedures will play a pivotal role in ending the sports ban crisis. 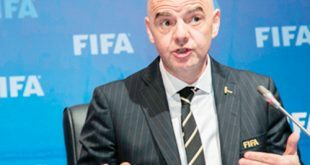 He called on FIFA to respect the wish of clubs to self-determination and to endorse decisions of the general assembly, which have been carried out without any pressure or intervention from a third party as alleged by some. He added, “We always respect the regulations of FIFA. The last steps are the interpretations of such regulations and laws of FIFA. We would like to explain that the information given to FIFA, especially to Fatma Samura, are all false and fabricated. We hope to put an end to this crisis for the benefit of Kuwaiti sports and the youths.” Marafie explained that Kuwaiti clubs respect all FIFA executives. The general assembly, which elected the former board of directors headed by Sheikh Talal Al-Fahd, is the same one that dissolved it today. Boskandar, Secretary of Kazema Club, praised the cooperation of Kuwaiti clubs in putting an end to the ban crisis. “They are keen on correcting the path by forming an interim committee for the next three months,” he said. Boskandar added that these steps are part of endeavors to reach final solutions to the crisis. He emphasized that the next period will witness new positive steps to handle the problem. He called on FIFA to listen to the Kuwaiti clubs and welcome their decisive steps, so as to let Kuwait to return to sportive activities. Sports is the best way to keep youths away from the dangers of terrorism, he added. He stressed that all decisions were taken without any interference from the government. 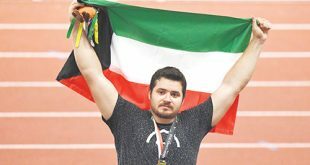 Waleed Al-Rashid, Secretary of Kuwait Sportive Club, praised the decisions of the general assembly. He remarked, “We hope our national teams and clubs will be back to participate in sports activities.” He noted there is no pressure from the government. All decisions were taken in a democratic manner, he said. He affirmed that Ibrahim Al-Shehab, who was selected to head the interim committee, is a beloved national personality. He is close to everyone and he has no bias. Al-Rashid also stressed that the sports crisis necessitates cooperation of all parties to convince FIFA to lift the ban.